So after the diffuser was cleaned up and to some extent restored, the next step was to fit it to the car. As I alluded in my intro post, the easiest way to do this, is to have the BNR34 V-spec triple cross bar installed (some people chose to have the bolts welded on the R33 triple cross bar instead). Truth be told, this I had done by Ninomiya-san way back after I first got these pieces, right about the time Igot my personalized number plate. But obviously, I have been too busy to work on this diffuser project since then. Anyway, the triple cross bar takes care of the front half of the diffuser. In the picture below, the front of the diffuser would be facing left, and the rear to the right. 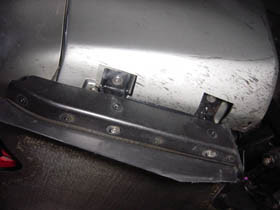 The front of the diffuser attaches to the left most double hole bracket by way of two metal brackets (like the one on the left in the photo below). 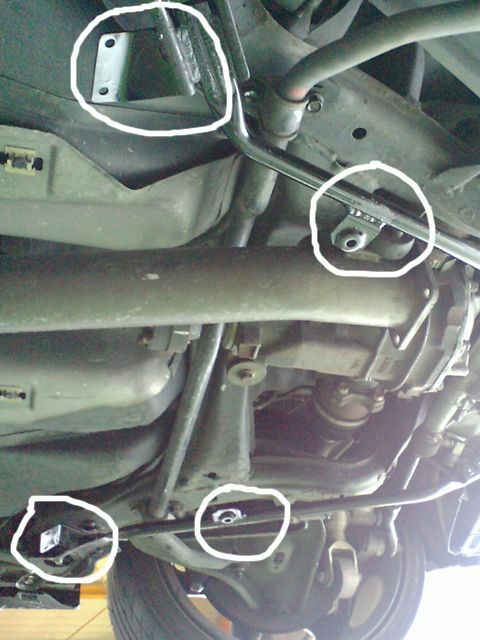 The holes in the middle, take a single bolt, the corresponding hole which is in the diffuser itself. 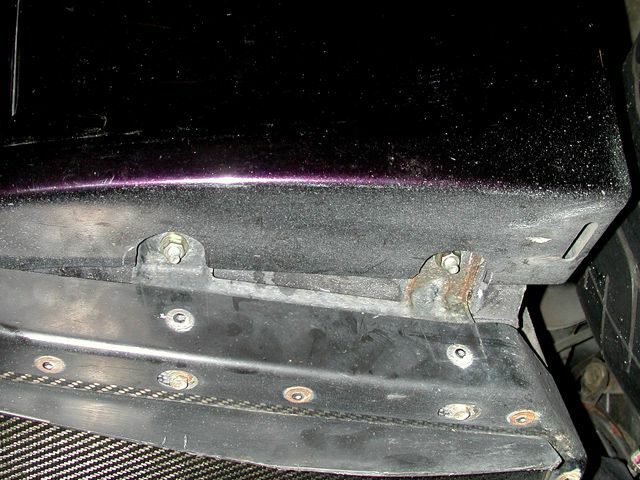 The rear of the diffuser is attached to the body by way of the side brackets (on the center and right), as well as a center bracket. 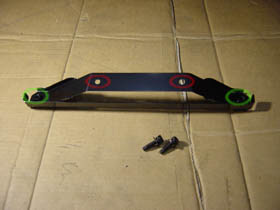 The side brackets attach permanently to the diffuser, while the center bracket is normally permanently attached to the car. The diffuser side is the left side with the cutout, the side that connects to the body are the two "fingers" with one hole each. 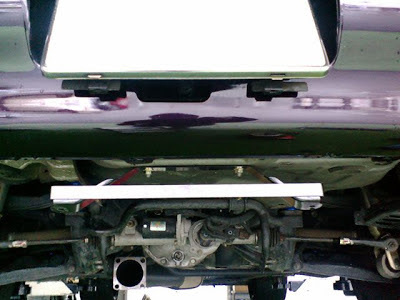 Or, get tucked in underneath, like this, with cutouts in the rear bumper or spats to allow bolt access. 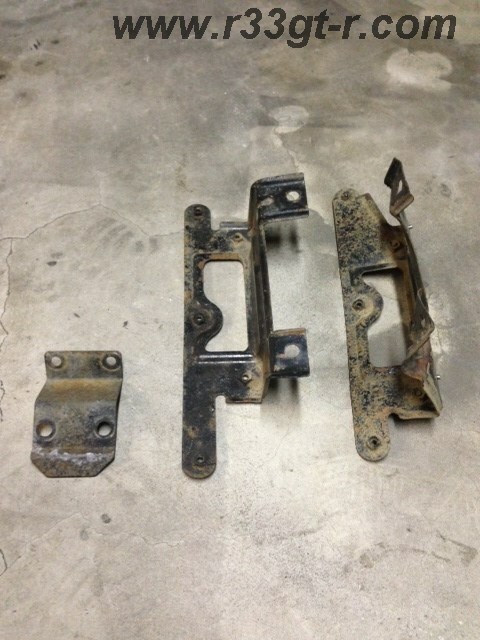 Then, there is the rear center bracket. It normally looks like this. Look closely, and you can see that the left side bent piece extends from the 0mm mark to the 125mm mark. 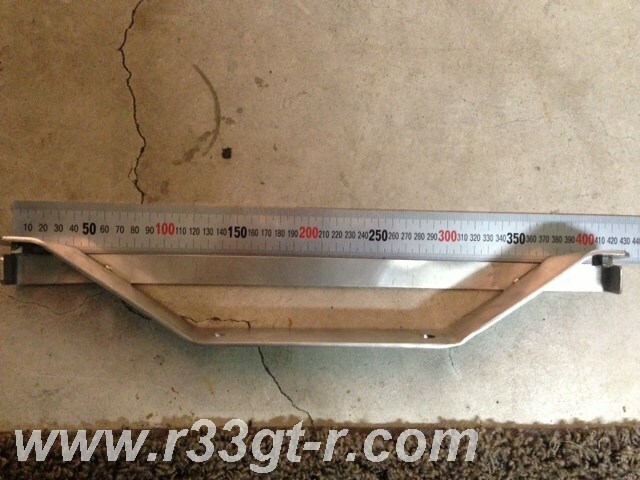 The right side extends from the 300mm mark to the 415mm mark - thus a difference of 10mm! So the left and right sides are not perfectly mirrored, and the angle of the bent pieces are also different. I can't use this!! Finally, there was the question of re-installing the fins. As seen in my previous post, the stock ones were essentially destroyed, and so of course I sought improvement. 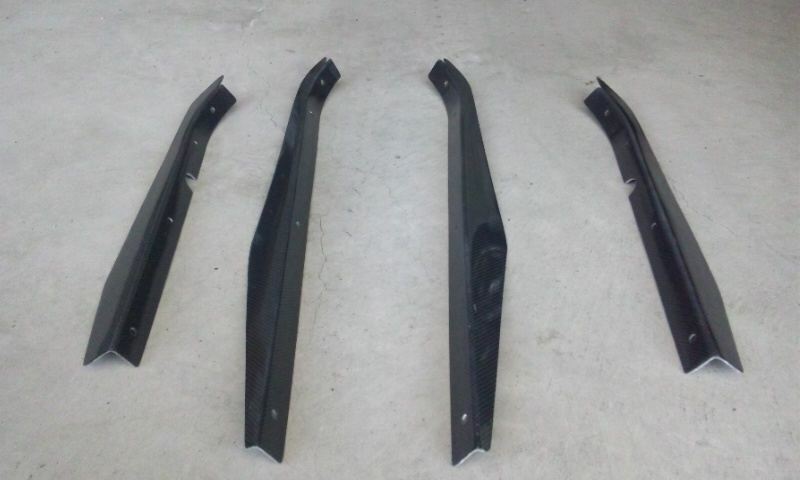 I looked at the Nismo ones made of carbon fiber, but not only are they made to order and cost 42,000 yen for the set, their tallness compared to stock is an invitation to getting damaged or snapping off in a parking maneuver. So I settled on these carbon ones from Wisteria Sports, in the same dimensions as the stock ones and for half the price of the Nismo. So the fact that I did not want to arbitrarily/sloppily drill holes in my car for the rear center bracket, which was off to begin with, as well as coming up with a solution for the side brackets, meant that I would be taking my car to BeAmbitious for the final fitting. And because of that, I chose not to install the carbon fins myself, but to have Ninomiya-san do it when the car was at his shop. Stay tuned as I next show you how I got the diffuser to his shop!